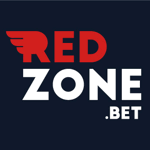 Red Zone Sports is quite simply the best place to bet on US sports in the UK, they pride themselves on offering more markets and features for American Football, Baseball, Ice Hockey, Basketball, MLS and pretty much anything else American (e.g drag racing). They are also known for running some of the lowest margins allowing them to provide the best odds and consistent value. They don’t just offer American sports they have a full sportsbook covering over 30 other sports from standard football, horse racing, tennis, golf, etc., to water polo, table tennis and chess. 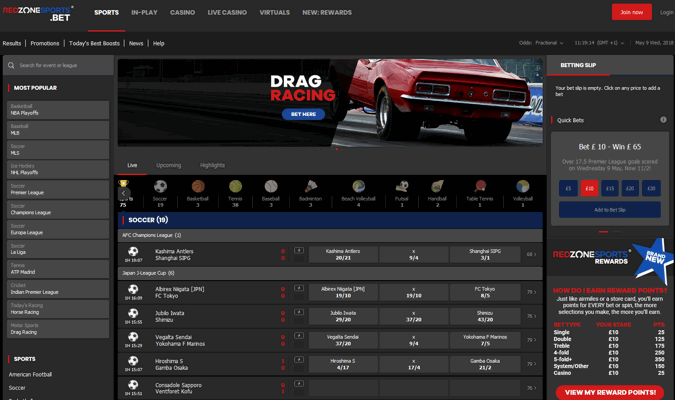 This stylish SBTech powered betting site has found a niche for sports across the pond without compromising on traditional sports markets either. Along with sister brand Sport Nation they are known also as one of the top brands for loyalty with industry leading rewards point schemes and free bet clubs. They also do not shirk on features either with full and partial cash out available along with a casino, live casino and large in play section. Enter code RZGLORY on first deposit. Free bet credited if your first bet on Glory Goals loses. Max free bet £250. Free bets must be used within 48 hours on any Glory Games market. Qualifying bets must be placed with 48 hours of making first deposit. Min odds of 1/5 for qualifying bets and free bet usage. BeGambleAware. One of the first things to talk about is the rewards club, this is identical to the Sport Nation version, which you can read about on our dedicated rewards club page. 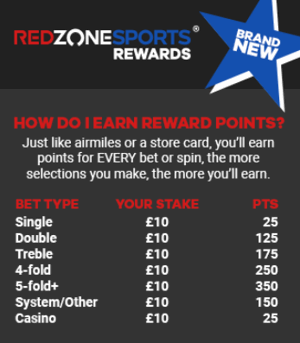 In basic terms this is one of the best loyalty points schemes around, rather than winning free bets or bonuses you can instead trade points in for genuinely good kit including designer brands, TV’s, gadgets, Apple stuff and much more, hundreds of items available. As you can see from the screenshot here you can earn points for every bet placed on sports or casino, rising the more selections you have in your bet. The loyalty scheme is in addition to already good value free bet clubs, boosts, acca offers and event specific offers. You can see now why this brand has a basic welcome offer but delivers for regular customers. It is surprising more companies don’t value loyal custom like this given how copetitive an industry it is. Red Zone have not shirked on the kit either with full and partial cash out, virtual sports, casino powered by micrograming and others and a live casino delivered by Evolution Gaming. All of this is before we’ve even got to main selling point of the site. In general the market depth is top end for all sports, but for US sports of all types this is the principle. There are no other betting sites in the UK that can match the depth of market and offers compared to RSZ. Add into this the low margins taken by the site and you’ve got an ideal betting package for everything American without losing out on the depth of a standard sports book. The news section is worth a special mention. As you would expect it is US Sports focused but it is one of the best resources of it’s type, in some areas with more depth than even the BBC. The brand is part of Argyll Entertainment, registered, licensed and operated from Switzerland with offices in London. They are a UK focused company that entered the market in 2016. The company are fiercely independent with a strong desire to do things differently from the now numerous out of the box bookies. For example, they have high stake and payout limits with offers and features that support the whole range of customers from low to high stakes. Their values mean they don’t over-spend on new customers at the expense of existing users and they always try to deliver something unique. Red Zone Sports might not be everyone’s cup of tea, especially if you don’t know what acronyms like NFL, MLS, NHL, MLB and NBA stand for. If however you do like this type of stuff then really there isn’t a better place to bet. Even if you don’t you can still find every other type of sports market available and get rewarded whatever you wager on too. RSZ is certainly tapping into a unique market and are leaps and bounds above the rest. It hasn’t always been so easy for Argyll however, their first venture Bet On Brazil didn’t quite work out (see what happened to Bet On Brazil). It had a lot going for it, centred around ex-Scotland and Ipswich footballer Alan Brazil, it tried to provide a more user focuses football themed experience. In the end it proved too niche and was re-branded to Sport Nation. If you like Red Zone Sports but are not so keen on the American stuff then perhaps head over to Sport Nation, who offer almost exactly the same stylised SBTech driven book but with a more traditional UK focus.